When I planned my trip to Japan last April, I had one non-negotiable location. Surprisingly, it wasn’t a fujoshi spree in Ikebukuro. Nor was it even paying homage to Akihabara. There was one thing that I really wanted to do in Japan — I wanted to see Haru, Nagisa, Makoto, Rei, and Rin’s hometown, Iwatobi. I honestly love beaches and I loved the scenery I saw in Free. I thought, if I’d visit the place, I’d get to appreciate the boys’ life a little more. If I visited Iwatobi, my fujoshi life for this year would be complete. Maybe. Hence, I turned to Japanese websites and found out that Iwatobi was based on Iwami, a coastal town in Tottori! I couldn’t resist the temptation and researched all things Iwami. With season 2 happening, I hope this post inspires you to visit this awesome town! Before you pack your bags, one of the things you could consider is how long you will be staying in Iwami. There are two ways to enjoy Iwami: day trip or overnight/weekender. I suggest a day trip for those who really just want to see the sights, take some pictures, and doesn’t want to spend a night in the town. I also strongly suggest this to travellers who are already in the Kansai area. It takes two hours just to get to Iwami from Himeji station so you actually lose half a day just getting in and out of Iwami. It also takes two hours to leisurely go around the Free! sites with a bike (you can rent one from the tourist office) or three hours to leisurely walk it. Now, don’t think that means the places are far. It kinda is and kinda isn’t. You can honestly finish your Free! tour in an hour but that means constantly walking around and seeing everything in a zip. Which isn’t fun. I think. I suggest the overnight/weekender trip for those who want to immerse themselves in the town. If you’re planning to do a Free! cosplay shoot, by all means, please spend a trip overnight or weekender. I suggest the weekender (2 nights) for travellers who are either coming from afar (Tokyo or Fukuoka) just to go to Iwami. It’s honestly a long and tiring trip. You’d probably dread just spending a few hours there to walk and bike and then travel again. The weekender allows you to rest for your first night and then you can play around the next day before you travel again in the morning. If you want to know some activities that you can do in Iwami, please visit the Iwami’s tourism website. I’ll go into them a little later too, if you’re interested. For folks who want to spend the weekend in Iwami, be prepared to brush up your Japanese because most accommodations in Iwami are locals and would find it very difficult to accommodate you if you can’t speak Japanese. If you’re afraid of your Japanese skills, there are larger hotels in Tottori which can accommodate you. My rusty spoken Japanese managed to get me by in Iwami so I think you’ll be fine. Besides, the people in Iwami are really helpful and accommodating and granted that if you can string a few sentences and at the very least you can understand the folks, you’ll be fine. The Iwami Tourism website has a wealth of information on accommodations. I’ve also been informed by a friend that you can also book hotels in Iwami at Rakuten Travel (which is an english site). Make sure you choose the accomodations in the 浦富(Uradome) area. Accommodations range from $24/night to $110/night. Usually, the cheaper rates are for sleeping accommodations only. On the other hand, some hotels offer breakfast and evening meals. If you want a taste of local food, this is a good option to take since there’s not a lot of restaurants in Iwami. When doing your reservations and you live abroad, it would be best to choose a hotel with a website or a working e-mail. In my case, I booked a room in Seaside Uradome which was a really nice hotel at the Uradome coast and is right smack at the beginning of the Free! sights. Seaside Uradome has an online reservation. This reservation is, unfortunately, is Japanese only. They will call your number after you make a registration so be sure to put in your number and be ready to talk to their manager. If you worry that they won’t be able to call you (since you’re living abroad) be ready to give them a call. The manager here is really nice and she’d be happy to accommodate your reservation. Apparently, when I went there, I was the first foreigner from Australia who went to her hotel. She’s had other guests from other parts of the world. Between the two, I prefer Seaside Uradome because of the convenience of their website, great location, clean ambience and rooms, and fantastic local food. Next stop, Iwami! Remember, if you want to do Rei’s morning run, stop at Oiwa! Do note that Rei’s an experienced runner! The easiest way to get to the town Iwami is getting a shinkansen train from Himeji to Tottori and then catching the local San’in train from Tottori to Iwami. Check Hyperdia for the best trains to catch the Tottori train to Iwami. If you’re using a JR Railpass for your travel, it shouldn’t be a problem since Iwami is a JR station. That said, there is a section of the railway that’s privately owned, hence be prepared to pay 1820 yen extra per trip. It’s a long train ride to Iwami and can range from 1.5 to 2 hours, depending on which train you manage to catch. Still, it’s quite a scenic route and it’s a perfect ride to actually buy an ekiben and enjoy it in the train. I do strongly suggest to make sure you arrive in Iwami at least during lunch. That way, you can still catch the local transport (a mini-van or the bike rental from the tourism office). By the way, make sure that when you travel to Iwami, you’re travelling light. Having a large luggage around would make things tad difficult since the trains to Iwami are a bit smaller. On your train ride, keep note of your stop before Iwami, Oiwa. This stop is where Rei hops off to run to Iwami. It’s a long way to Iwami from that station so I’d have to give Rei some kudos for running that far. Such an awesome boy! Once you arrive in Iwami, you have three choices when doing your Free! tour. You can either take (a) mini-bus, (b) bike, (c) taxi, or (d) walk. All of these options are available as soon as you step out of the station. The mini-bus parks next to where the taxis are lined up. It looks like a mini-van at most and hardly looks like a bus until you notice people riding it or that a driver is waiting inside. Taking the mini-bus does require some Japanese skills but fret not, I can give you some key phrases to learn. Just remember that there are two directions for the buses in Iwami. One bus heads to Tottori and the other bus heads to Tajiri Port. If you’re coming from the train station, be sure to ask the driver, “Tajiri-ko made ikimasen ka? Tajiri-ko ni tomete kudasai.” (Is this bus going until Tajiri port? Please stop in Tajiri port). Don’t forget to ask the driver how much the fare is before alighting the van. And don’t worry about missing the stop. The driver is also super accommodating and will tell you when you are at Tajiri port. I suggest this for people with some luggages, for people who are staying in Seaside Uradome (just change Tajiri-ko to Seaside Uradome), and for people who are not fond of physical activities. Taking the taxi is the best option for those who don’t want the hassle at all. Again, they’re lined up in front of the station. Just a note, finding a cab in Iwami station is easy but finding the taxi back is quite difficult. Also, cabs in Japan are mighty expensive. Unless you’re a big group, this should be your last resort. Taking the bike is probably the most popular and best option among visitors I saw in Iwami because quite a lot of girls actually rent them. To rent them, you just have to go to the Iwami Tourism Office which is to your left as soon as you exit the train station. You can rent the bike for 500 yen/day which is not so bad. All you have to say to the people in office is “Bike rental onegaishimasu,” and you’re pretty much on your way after paying and filling up some forms. You can also get the Free! 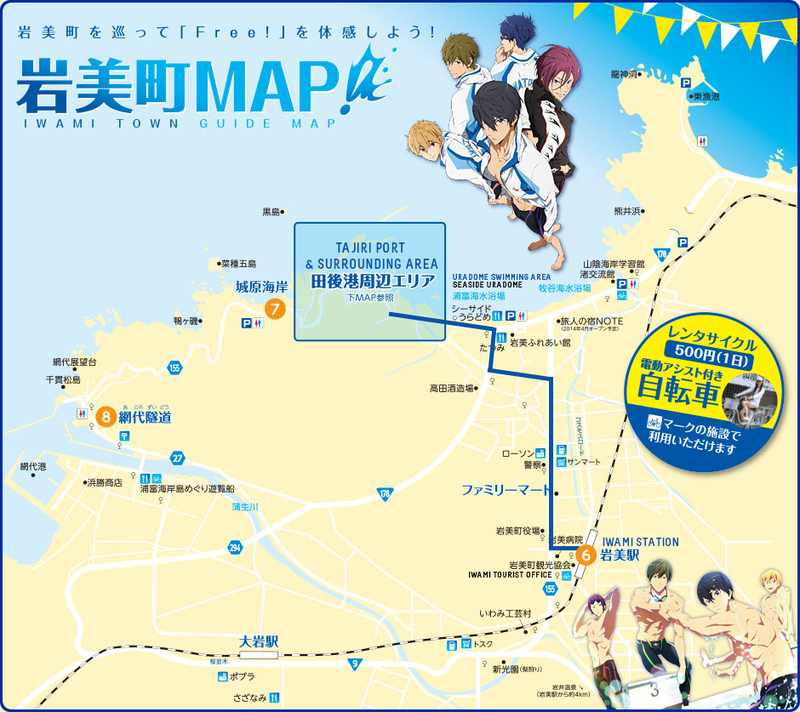 map which will help you get from the Iwami train station to the Free! sites. With the bike option, you don’t have to worry about the direction of the buses or hoping to find a taxi. That said, navigation skills are required when biking around town. Having a GPS on your smartphone and google maps also helps if you’re not good in reading maps. But worry not, I will be providing a translated map for you guys a little later. Walking, as I said earlier, is also a good option. I tried walking from Uradome coast to the station and back and it took me a leisurely hour and a half to do that. That meant I had time to stop by convenience stores and the information office and even leave a message and all that. It’s also not a difficult walk. There’s no crazy uphill and there are nice pedestrian lanes for you to have a leisurely walk on. From the Uradome Coast to Tajiri Port, it takes an hour and a half of walking. And this is with all the crazy pictures you could be taking along the way. Just in case, have your google map ready in case you get lost! But before you get around, make sure you stop by the Iwami Tourism Office which is at your left once you exit the station. If you also want to ask for any information like restaurants open or activities you can participate in town, this is the best place to go. Again, some Japanese skills are required to converse with the staff but they are very much helpful. If I’m not mistaken, there are cooking classes in the Iwami office too so if you’re interested, you can join a cooking class! It’s a good glimpse of the town and if you have like an empty passport or a travel notebook, you can stamp your notebook with their local stamp! Another fun thing to do is signing the Free! Fan Notebook! There’s tons of fellow fans who visit Iwami and they leave their twitter names, draw fan art, and such! OR, in the case of my friends, it was a place where they can leave messages to the town or to future visitors. A message for the awesome Iwami. Also, super sorry for my horrible drawing. Visiting the tourism office gives you a good preview of Iwami life. Now, once you’ve done your shopping and more importantly, got your Free! Location Map, it’s best to start visiting the Free! sites. So here it is the awesome Free! Location map. Just click on the images to see something bigger but let this only be a guide for those who are bad with maps or has difficulty understanding Japanese. I have to thank the Iwami Tourism Office for having a dedicated page for this and for making these brochures with Kyoto Animation. It’s probably one of the most organized location trips I’ve been to in Japan. It’s honestly quite straightforward and accurate. And for everyone’s convenience, I’ve also marked the routes and translated the locations in English, in case the kanji doesn’t get to you. If you’re visiting Iwami alone, I’ve noted the 6 sites which are right next to each other. As I said earlier, you can walk this or ride a bike. The town’s very safe and the walk is scenic and leisurely and you’ll be done in no less than two to three hours for this section. I, unfortunately, did not visit the tunnel or other sites (like the Tottori sand dunes which was used in the ED), but I think you’ll have a good time going through these places. 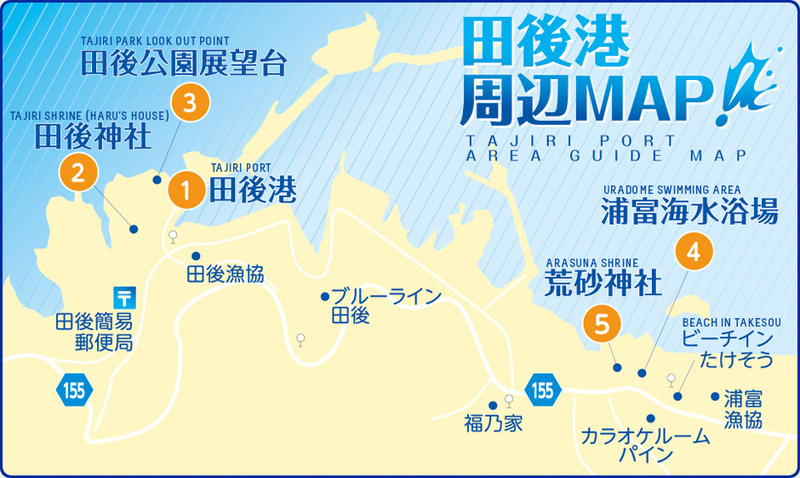 If I can make something simple of this map, there are three areas you can visit: Iwami Station Area, Uradome Swimming Area, and Tajiri Port Area. The Iwami Station Area is a good start and quite straight forward. If you follow the line that I’ve drawn, you would be stopping/passing by Lawson and Family Mart featured in the series. The route I’ve drawn also leads you to the Uradome Swimming Area. The Uradome Swimming Area is basically the beach you see throughout the series. This starts from Seaside Uradome and you can walk by the beach until you reach the small island with the tori which we see all the time in the beach scenes. The large building at the end of that row Beach-in Takesou. This place also has Free! posters on its windows! Can you imagine hanging out with the boys outside Beach In Takesou? Just a few steps to the left of Beach-in Takesou is Arasuna shrine. Arasuna shrine also has a lookout point, but the route going to that place is a bit difficult to go to and is quite dangerous so don’t go there unless you’ve got a good sense of balance and knowledge of how to be careful in mildly dangerous high places. A fifteen minute walk further left of the Uradome Swimming Area is the Tajiri Port. The port is quite bustling with fisherfolk and locals. At that time, there were many fisher folks who were harvesting wakame so a lot of them were drying them out in the sun. From the port, there are stairs that leads to the lookout point. If you want to take the scenic shot of Tajiri port used in Free, then please take this stairs. Half-way through your climb is the place that looks like (a) the place where Haru talked with Makoto in the evening and (b) where Rin paid respects to his dad. The awesome Iwami ladies drying their wakame. Behind them, you can see the stairs heading to the lookout point! The Tajiri lookout point is just as beautiful as you saw in the series! BTW, the round thing they sat on was really a seat (and a place where they dry their wakame). It’s not a covered well because I think it’s just too high and too narrow to be a well for anyone. Now I’ve heard from a friend that this lookout point could be closed on some days. If that’s the case, you just have to head straight towards the Tajiri Shrine (Haru’s House) to go to the lookout point (which has a path at the right side the temple). The path towards the Tajiri Shrine begins from the Tajiri port bus station. From the bus station, you will see the famous row of Iwami manholes. Just follow it until you notice the shrine stairs and then Makoto’s house. Head up higher and you’ll find Haru’s house (which is the shrine) and head towards the right to find the lookout point. The stairs to Haru’s house! Now this post is TLDR to add my entire feels about this place but I’ll leave that to my album which captured my interest and feels about the town. What I can say with great joy and brevity: Iwami is a lovely and beautiful town just as we have seen in Free’s Iwatobi. It’s a quiet place so it’s not the kind of place where you expect a party happening, but it is for travellers who love to take a quiet beach break or for fans like us who would like to immerse in the world of Free! The people were all lovely. The food was awesome. The scenery is just as I had imagined. Watching Free! after visiting Iwami made the place more real to me. And while I doubt I’d ever cross a swimming team in Iwami, I do now understand Haru’s fascination for water, Makoto’s kindness, Nagisa’s enthusiasm, Rei’s beauty, and Rin’s love for this town that will always be his home. I’d say, it was worth the distance. I had so much fun and I honestly plan to visit this place again. Maybe, in future fish! Thanks so much for posting this! I am headed there in August and have been using this as a guide. I’d like to walk along Uradome Coast. Is there a hiking trail (to the left or to the right of the main road down from JR station)? I think there’s a path by the side of the train since I saw bikes take that route. It’s the same path Rei uses when running to Iwami. Hello! First of all thank you for this post! I was just surfing if there really is an “Iwatobi” town in Japan when your post popped up, and it took me by surprise. I am scheduled to go to Japan this July 1st (for a concert and for Free! Timeless Medley screening)..then I read this. .major change of plan as I will go there in Iwami! Thank you again! Thank you in advance as well! Hey! I am using your guide to plan my Iwami trip in March. I made a reservation at the uradome seaside resort link you attached, but it didn’t ask for money. It said to pay in person (in japanese) and gave me a confirmation code. I’ve never traveled to Japan before, so I have to ask: does that mean my reservation went through? Yes. You should be able to get a reservation confirmation from them. They will ask you to pay in person and I believe you can use credit cards with them. Enjoy your trip and have fun! sorry to interrupt, i just finish my booking on seaside uradome as well, but they said that Free! spot are in Iwami machi, not in iwami,.. are you stay at seaside uradome while you visit iwami and make it to visit all free! spot? Yes I did! Seaside Uradome is a bit “far” but still walking or biking distance from the Free! spots as they are closer to the city. If you see the map above, Seaside Uradome’s not in the Arasuna/Tajiri Port Area. The closest hostel to the Free! Spot is Beach In Takesou which is near the Arasuna temple. From Seaside Uradome, it takes 15 minutes walking towards Arasuna and 30 minutes for Tajiri. It’s a nice a leisurely walk so it should be relaxing. Hello there.. I’m sorry for interupting. But, may I know about your specific date to visit Iwami this March? Hi Jessica! I hope my answers help. 1.) My suggestion highly depends on your luggage. Biking is convenient if you just have an overnighter bikepack. If you have a boston bag or larger, the easiest way is to wait for the mini-bus. I am not sure if the mini-bus increased in price since my last visit but I remember paying around 300 to 500 yen to get dropped by Uradome. Just remember to take the bus towards Tajiri and ask them to drop you off in front of Seaside Uradome. Walking is an option if you have a light luggage since it’s quite a walk from the station. 2.) With regards to overnight rentals, I think it’s possible. Just ask the Iwami Tourist Center where you will be renting the bikes. I believe they’ll ask the deposit of 500 and then you pay the rest when you return the bike. I’ve never done this, so this may have changed too. As for leaving the bike, I’ve seen girls who leave it by the port. Just make sure it’s not in an inconvenient area where cars pass. There are parking spaces for bikes and cars near the area so you can drop it off there. 3.) The manager will make an effort to understand you and show you the ins and outs of the hotel but she does not speak English well. So communication might be mildly difficult. Just know some key phrases about accommodations in case things get difficult. If you have specific requests, get those phrases ready as well. I remember that you can pay this reservation in cash or in credit card so know those too! I’m not sure about that. You can possibly ask the information office although I think they might recommend that you stay in one of the inns in town. If you don’t get meals, they could be as cheap as $30. There is one near the train station, in the tourist office: lockers for smaller ones at the entrance and they take bigger ones within the office. I have a few questions. First of all, what's the wifi/internet there like? I know tourists get free wifi but do you have any idea if coverage is good enough in Iwami/Tajiri. I will be getting there from Kyoto so hopefully I can find my way without getting lost ( =.= ;;), especially if wifi isn't good. Another important thing is looking for a place to stay. I'm planning on staying near Iwami/Uradome for 2 nights. I read what you wrote about seaside Uradome. Does it have onsen? I really want to try onsen near Iwami area but the ones close to Iwami are quite expensive and over my budget T.T. Last but not least, any tips for solo travellers to Iwami? Hopefully my average Japanese would get me by while I'm there. Hi! Thanks a lot for sending me this reply and I’d be happy to answer as it was such a lovely experience! The wifi/internet situation in Iwami was fairly all right. I unfortunately didn’t use the portable wifi service. My phone had a reasonable roaming service which allows me to use my allocated 4g internet even when roaming. My phone connected to Docomo and Softbank in Iwami and the service there was between 3g to 4g. Most of the time, it’s 3g. That said, I managed to navigate through the town using my phone and without getting lost. I think wifi will be all right but if all else fails, ask for a map from the tourist information center! As for Seaside Uradome, yes, it has an onsen and is definitely worth the price! It’s not a rotenburo but it’s all right. At most, it wasn’t too hot. If you get a package that doesn’t include breakfast and dinner, then it’ll be cheaper. Last I checked, it’s around 4,000 yen, thereabouts. There are cheaper options and I think there’s a large public onsen in Iwami as well but I wasn’t able to check it out. As for solo travelling, as long as you’re equipped with a map, it doesn’t hurt to go around the town and enjoy the place. Walking around was something I enjoyed when I was in Iwami and was definitely worth the treat. Average Japanese is just as fine as the folks are very helpful of tourists! Just remember to be polite and don’t hesitate to ask! Pingback: [Anime] Free! | . : Hoa Lê :. Hi, I have to say this was one of the best Free!-Iwami posts Ive read. Your post actually inspired me to book my trip, and Im going next April. I was wondering if you still planned on creating an English translated version of the Iwami-Free! map? Thanks again for this post! SUPER helpful! Hello! If you check the maps above, it has the english translations already. At least, the relevant English translations. How were the rooms at Seaside Uradome, and do they have separate showers instead of an onsen? Would you recommend just getting the plan with breakfast and dinner or is it possible to just walk out a bit and find food around Uradome at night? Thanks a lot for enjoying this report! As for Seaside Uradome, if you book a room with them, they will ask if you want your own private toilet or not so make sure that you do. As for breakfast and dinner, walking out a bit from the Uradome coast to find eats is a bit difficult. Not impossible. Just difficult. There is a restaurant in front of Seaside Uradome that sells udon, okonomiyaki and the likes but they are open around lunchish. The rest of the places there are also smaller inns that open when they feel like it. Iwami at night is a bit… too dark, given it’s a provincial town and lights are sparse so I highly discourage walking around that late at night.